Every garden is basically its own micro-climate. In our little crook of mountain, the season seems to run a couple of weeks behind many others we see along the route as we climb in altitude. I waited the longest time for the cherry tree to bloom. I went out every day and examined the swelling buds, hoping for something to happen when I spent my time there. It was kind of like I was hoping for a sign of some kind. Wouldn't it be nice, I thought, if the tree would bloom while I am here. It would be like a word, a promise. Waiting is numbing, and it is like a hand across my mouth. I wait for the cherry blooms to fold out. A flash of fear while I pitch my will like a stone and wait for a return. Maybe, somehow, I have made bad choices, done something wrong, never giving the seeds I put in the ground a chance. Maybe something happened and somehow also the tree in the garden has died. I finally had to go back down to the city, sending my will over my shoulder one last time, to see if the blossoms would spring open before turning my back on the dark barren branches. In the city, friends are gathering, shaking off the winter chill, meeting outdoors, and visitors stream through. Cousins, sisters, relatives near and far call and we meet. We sit in the square in front of Cafe Perl, sipping red wine under a fragile shower of rich pink petals floating down on the breeze. Daily work takes on an urgency again, discussions resume, calls are returned, notes are sent. Lists begin to fill out. The rhythm of the season is pulsing in the city, the river valley churns through its blooming process. I am still waiting inside. Back up there, with wisps of chimney smoke and cool breezes cutting through a new frank strong sun, stronger than before, blooming was like a fan had been snapped open at the opera. We arrived and there she was, the diva, tall and fluffy, booming, there in her position of power. She speaks. See? You could have waited. It would not have killed you to wait. The tree was full of big balls of fluffy pale flowers. I thought the blooms would be more pink, but I am happy, wondering what the apple blossoms will look like. One by one, things will fall into place. Oh how pretty she is! 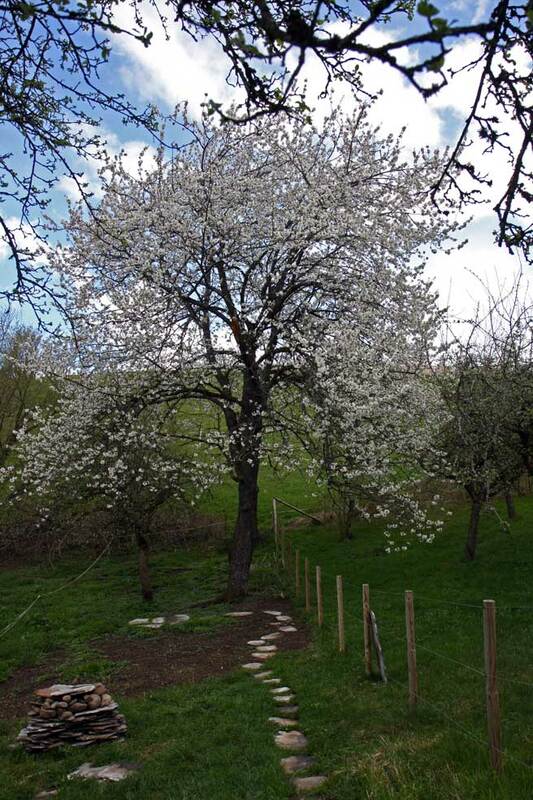 Our apple trees just bloomed recently too (still in bloom now). Maybe you were seeing cherry trees because the cherry tree bloomed first and to me looks very similar to the apple blossoms. It was all fast and furious and is done and already has its leaves. That really takes my breath away. Spring in rural France is so green. It will be 2-3 weeks before we seen anything like this in Wisconsin. "One by one, things will fall into place" .....absolutely, and we are always just waiting. "...blooming was like a fan had been snapped open at the opera." Lovely image, perfect descriptive writing. I love the way you write and look forward to your stories about everyday life in France. 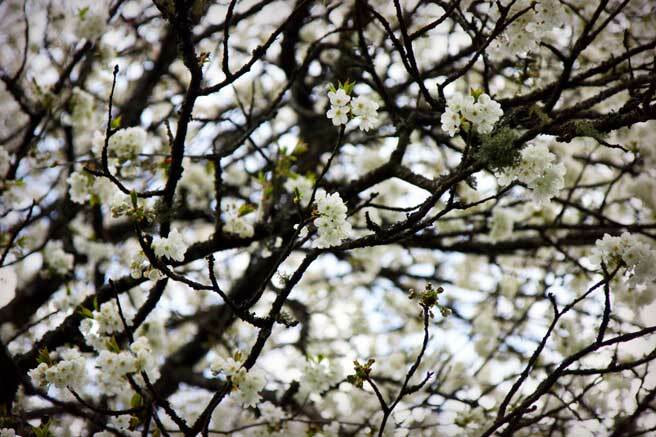 And, you're absolutely right about spring --one day the branches are bare, then temperatures warm, and almost overnight leaves appear seeming to narrow roads as they encroach from all sides with their new foliage. We bought a house and property late last summer that included a small orchard of a cherry, apples pears and plums so I, too, amd holding my breath to see what beauty unfolds. I was happily surprised with lots of spring bulbs and I am dying to see what colour the poppy will be. Oh, it's such fun! I am keeping my fingers crossed that our little swallow family will return, it was so much fun watching the five big babies learning to fly. I am over the moon to finally have my own place in the country! I am so glad that you are enjoying yours. Congratulations on your baby-to-be! Thanks for the nice comments, friends.